Video clip synopsis – Indigenous art is like topographic mapping of land and culture. Michael Nelson Tjakamarra works at painting concentric circles which represent sacred sites. Warning - Aboriginal and Torres Strait Islander viewers should exercise caution when watching this program as it may contain images of deceased persons. To download a free copy of this Video Clip choose from the options below. These require the free Quicktime Player. Broadband MP4 dreamings_bb.mp4 (7.0MB), suitable for iPods and computer downloads. You can buy this clip on a compilation DVD. You can buy the program this clip comes from. Dreamings, Through Indigenous Art is an excerpt from the film Dreamings – The Art of Aboriginal Australia (30 mins), produced in 1988. The art of Aboriginal Australia is celebrated in Dreamings as we journey into the sacred heartland of Australia to see traditional artists at work. The artists talk of their work, its association with the land and its spiritual connection with their people, the animals and plants. The film explores the meanings behind the works, from acrylic dot paintings of the Central Desert to cross-hatched bark paintings and burial poles of northern Australia, as it allows the viewer access to the oldest continuous art tradition in the world. Dreamings – The Art of Aboriginal Australia is a Film Australia National Interest Program. 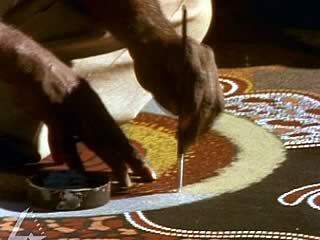 There are several different major Aboriginal art styles, including X-Ray and cross-hatching, and the one seen in this film, the dot style from Central Australia. Aboriginal art was traditionally created on bodies, in the dirt, on trees or artefacts, and on rocks. In the 1970s school teacher Geoffrey Bardon encouraged the Papunya Tula people of Central Australia to use acrylic paint on canvas, boards and cloth, which triggered an explosion of traditional and new Indigenous art and an increasing respect for and recognition of it among non-Indigenous Australians. Aboriginal art works reflect *culture and environment and are often created as a co-operative work. Dreaming stories tell about how and when the earth, as Aboriginal people know it, was made. Dreaming stories are passed from one generation to the next through songs, dances and art. What does the video clip show? What are the messages of the video clip? What is this artist’s aim or purpose in creating the painting? What is its meaning to him, and to others? How does it reflect nature? Why is it so important to the artist that his culture is passed on in this way? Invite an Indigenous artist, or an Aboriginal gallery owner to class to show and discuss indigenous art. Indigenous culture has developed over thousands of years in a particular environment. Discuss the difficulties and problems that are created for traditional culture in a modern world. We tend to refer to Aboriginal culture as the ‘Dreaming’. Collect a number of definitions of this term. Which is most satisfactory? Adele Pring, Aboriginal Artists in South Australia, Curriculum Resources, South Australia, 1998.